' Charlie's Angels and my sisters - Sisters, What! Was looking through my pictures (real pictures...not my ones on the computer) the other day and found these pictures of me and my sisters. I love them. I am so lucky to have them. Even though I just saw them a few weeks ago I miss them. I get really sad when I think about my sister Hava moving closer to the rest of them while I move farther away. Sad. These pictures make me smile. I have chosen to hang them in my office so I can smile more and be sad less. Who knows...maybe in another 2 years I will be lucky and blessed enough to join my sisters out west. This one was during a family reunion. Love the look on Sierra's face. Cracks me up. This one was at my brother's wedding...our typical pose. Apparently it scares Anne. This one was at Hava's wedding. Man look how tan I was! This was while we lived in Hawaii. Miss the beach. 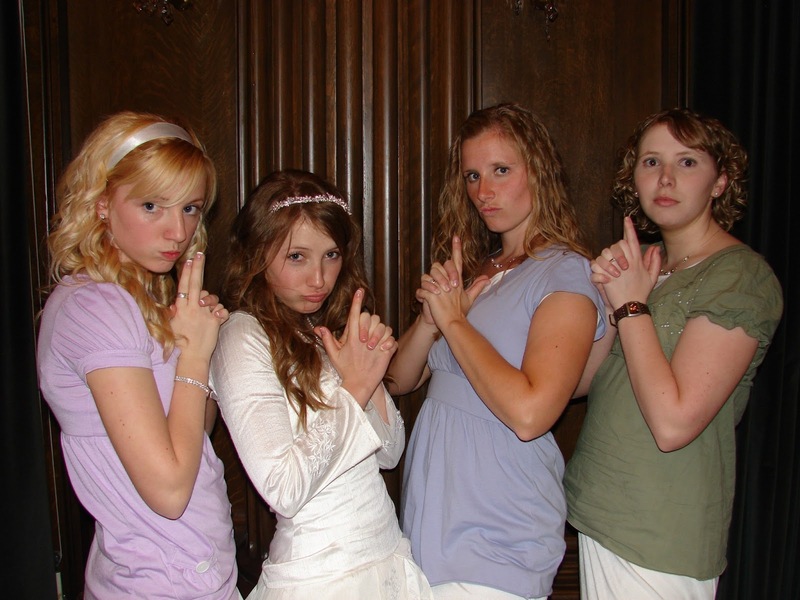 I do not understand the Charlie's Angels pose...none of you are even old enough to have watched it. Miss you too Joy!!! We pray you will be back here soon. It won't be long (fingers crossed) that we are all closer together.